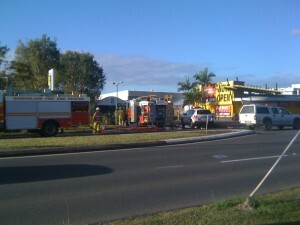 A ruptured gas line is causing chaos in Rocklea. Emergency crews are at the scene and have evacuated the Sherwood Road Chemist Warehouse. At about 3.30pm a truck reversed into the gas line. “There was a loud hissing noise and it smelt like gas. Then the truck driver came in and told us what happened,” a Chemist Warehouse employee said. A police spokeswoman said the Brisbane Markets were evacuated as a precaution and there have been no injuries. The evacuation zone extends from the Brisbane river, Oxley Road to the Ipswich motoroway. Emergency crews are still at the scene. A fireman said they will have to excavate a neighbouring field to find the shut off point. This could take all night.